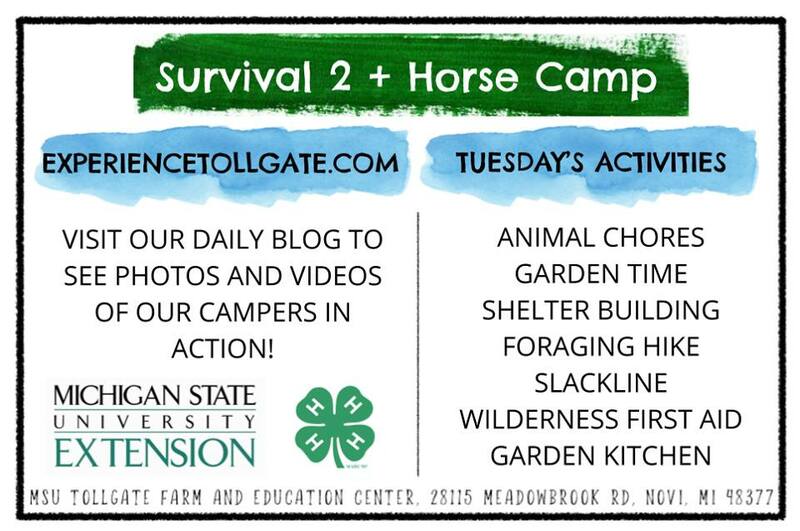 ← Check Out the Tollgate Camp Video! Welcome back. 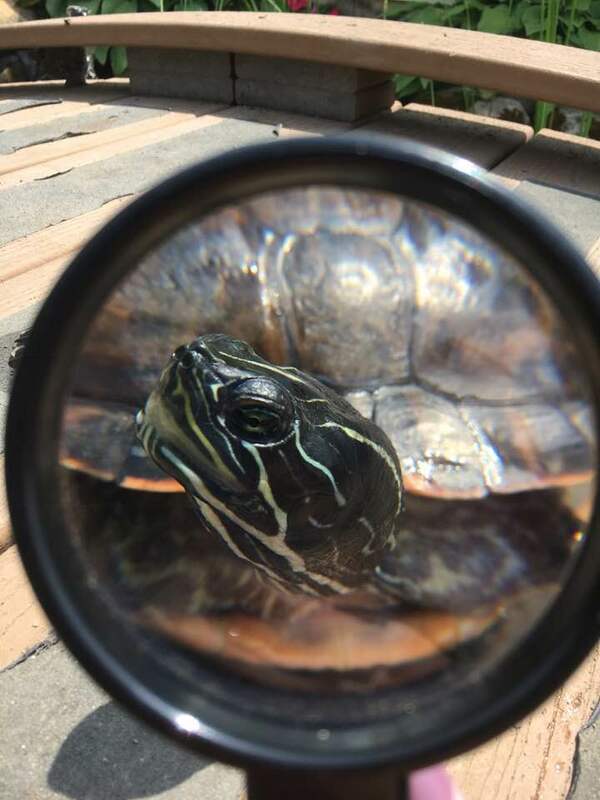 If you’ve forgotten, I’m Detective Coltrane Turtle, and I’ve been hired to determine whether or not campers are having fun here at camp. What follows is my day two investigation. 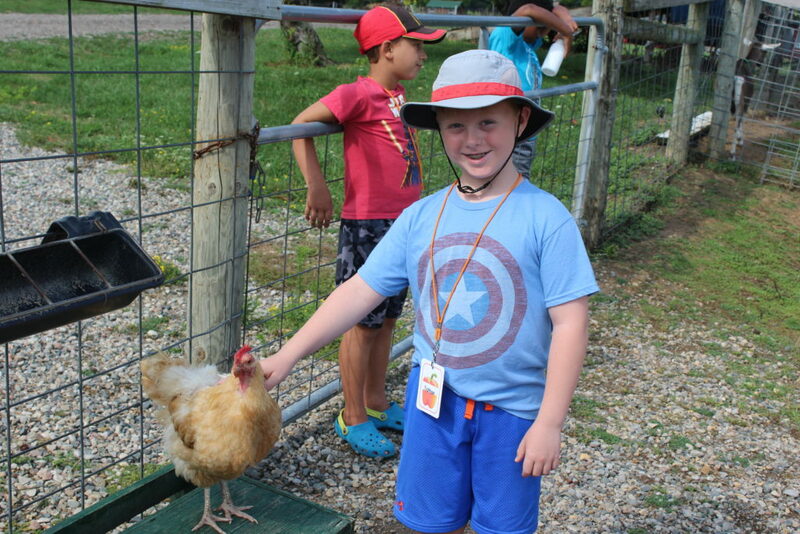 The campers were back at it with animal chores today. Those animals sure do require a lot of care! 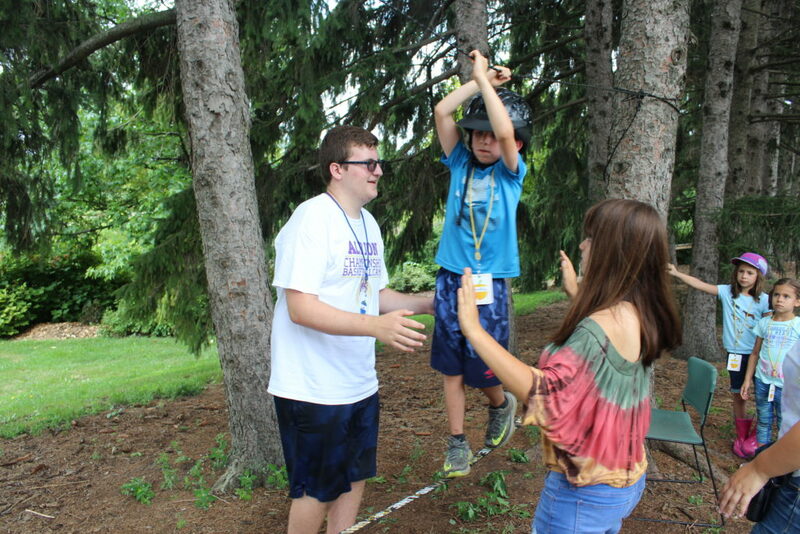 Luckily the campers are always willing to help out. 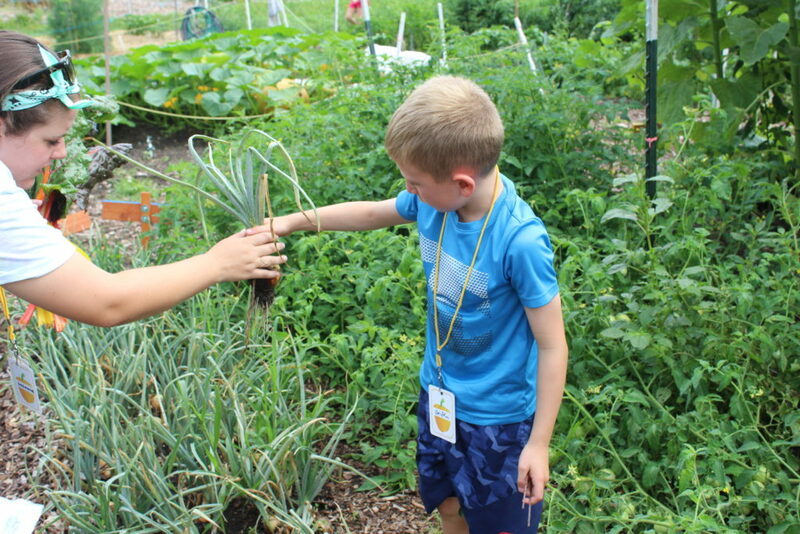 Then, campers continued on down the path all the way to the edu-garden! 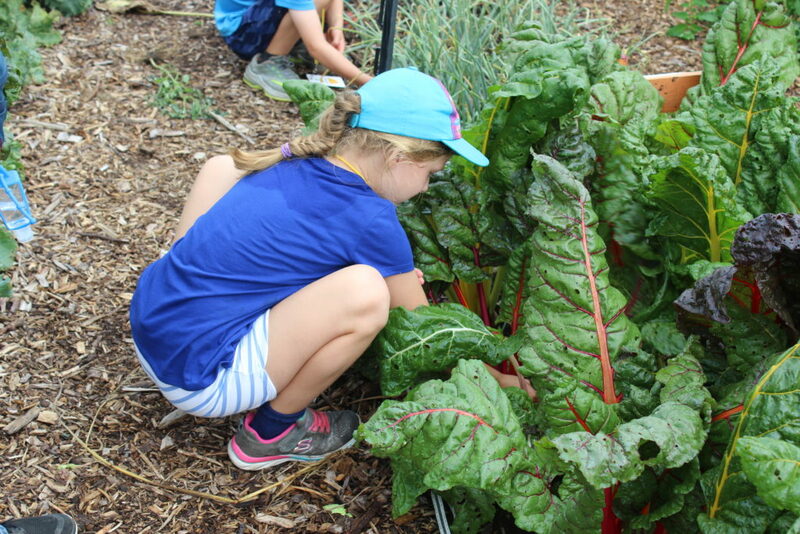 Campers got to take a tour of the various fruits and veggies, and they even got to harvest some rainbow chard and onions. Maybe I’ll see those veggies in Garden Kitchen soon. 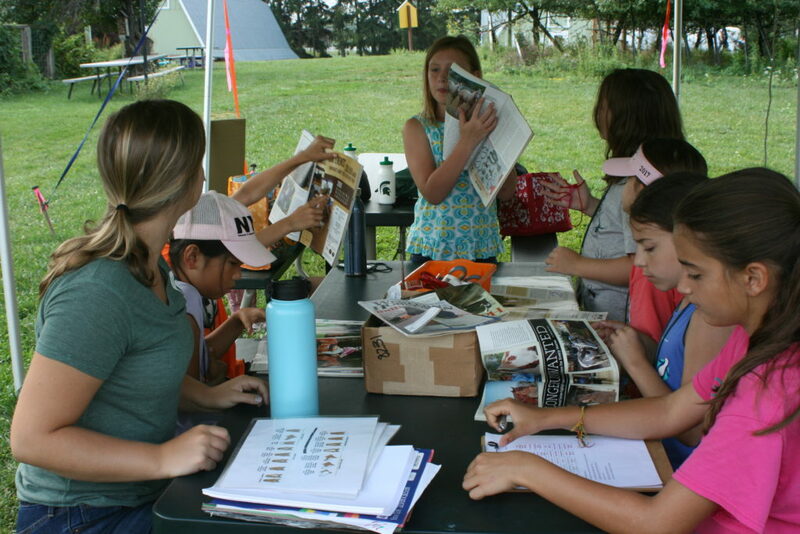 . .
Then back at the pepper spots, campers got another Leave No Trace lesson. Today, they talked about the effect that trash has on the environment, and the importance of treating nature with care. 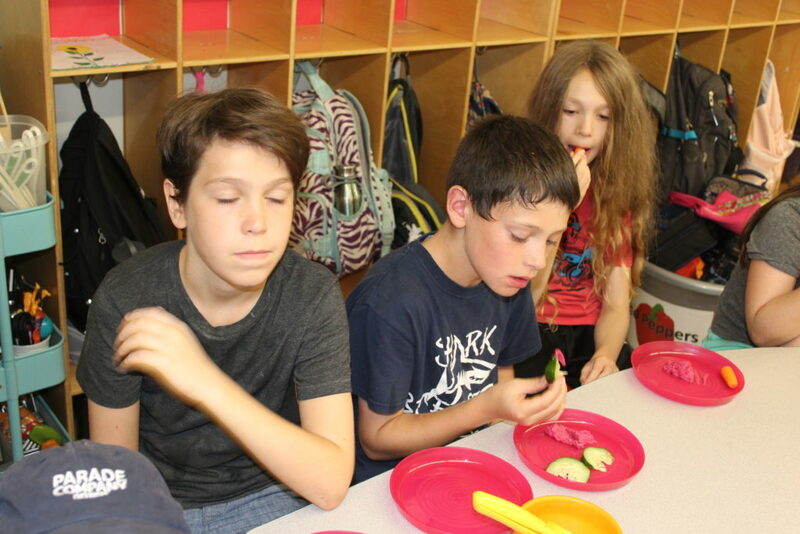 They also had a yummy snack during this activity! 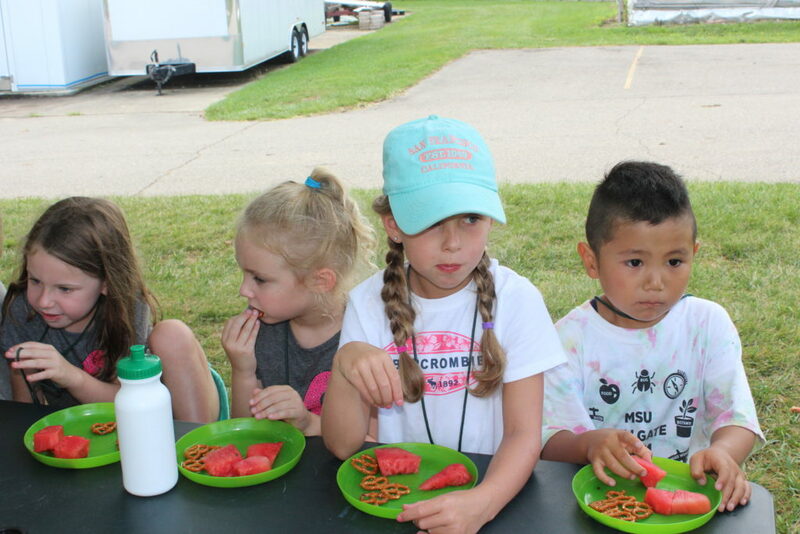 You can’t go wrong with watermelon and pretzels! After everyone made it across the slackline, it was time for a lunch break. And the campers needed to fuel up today because they had quite the afternoon! 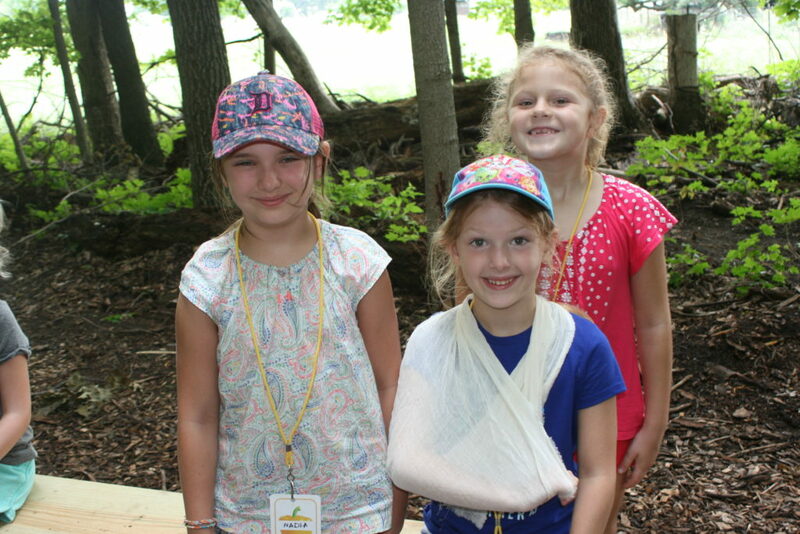 The first thing on tap was a little lesson on wilderness first aid. 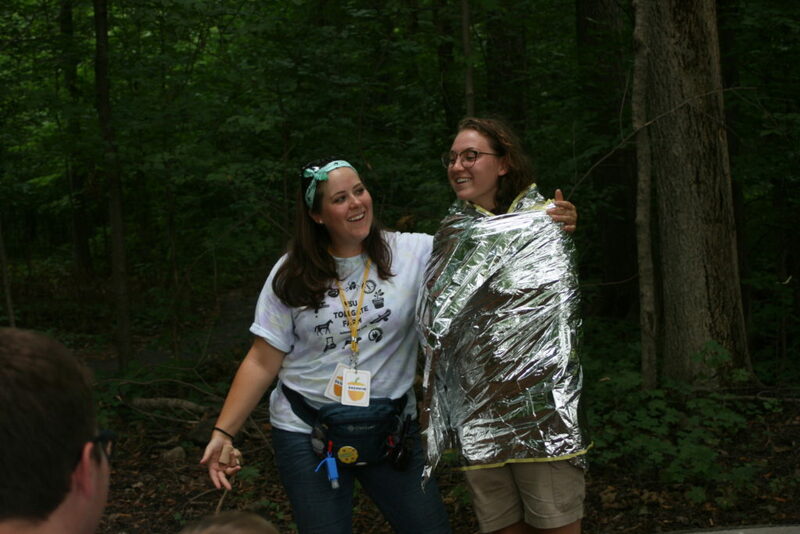 The peppers burrito-wrapped Ms. Claire! 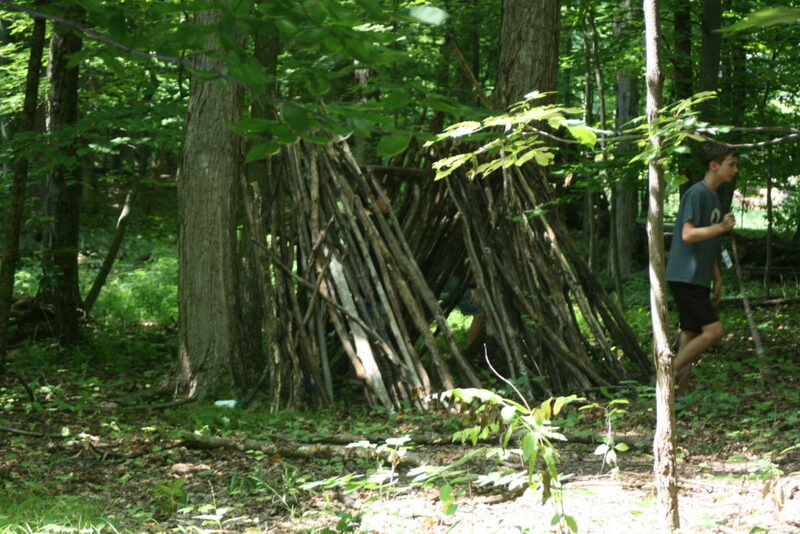 While they were out in the woods, the campers also added to their shelters. It’s only day two and they are already looking really great! I mean, it’s not as convenient as just having a shell on your back, but still. 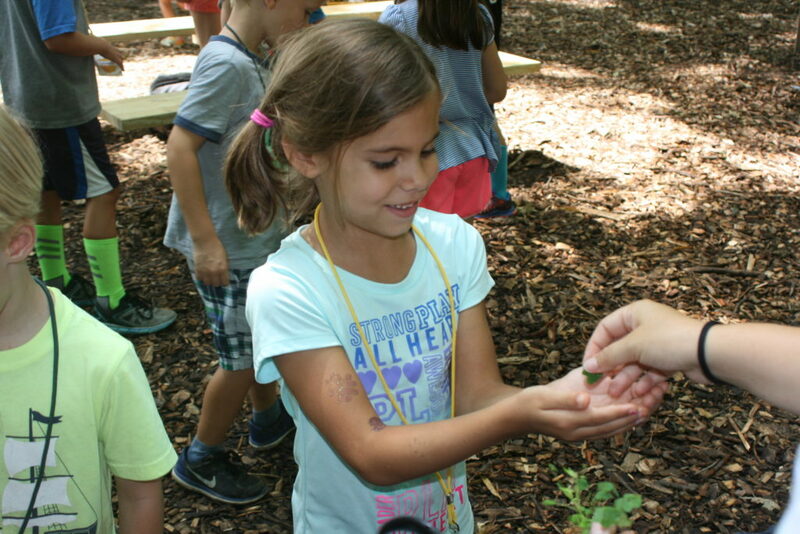 After that, the campers CONTINUED to hang out in the woods for a foraging hike! 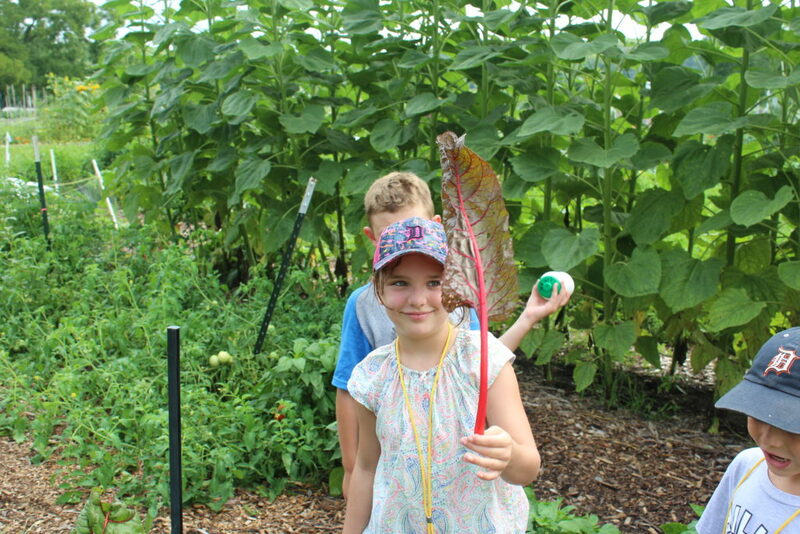 This is where campers search the forest for edible greens such as dandelion and cattail. So all in all, a pretty busy day! For more photos from my “Tollgate Investigation” folder, click here. 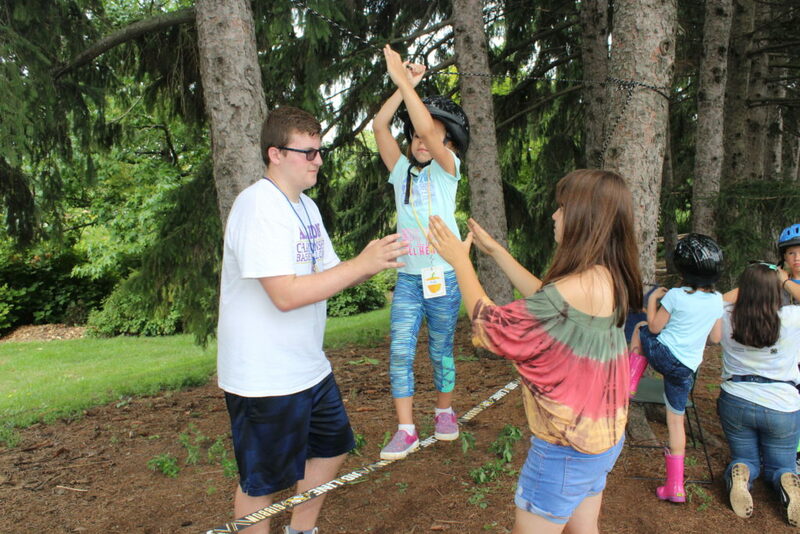 Meanwhile in Horse Camp, campers were riding again. Today, the saddle went on Tulsa and Jade, who are both great friends of mine. It looks like the peppers are really starting to get the hang of things! Look at that horsey tail! 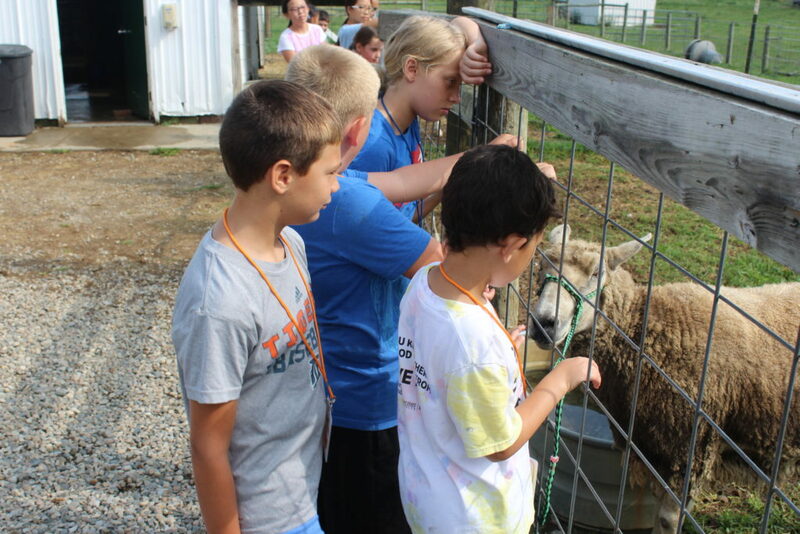 Campers also had some great discussions about the way that the horses are treated here on the farm. Ms. Nicole S. and other Tollgate personnel always make sure they have lots of space, food, water, and shelter. 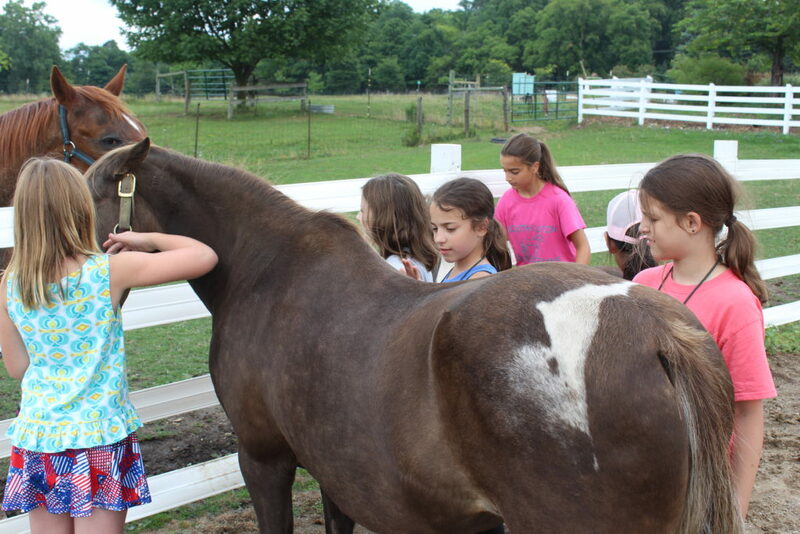 Additionally, campers talked about the different colors and markings that can be found on horses. 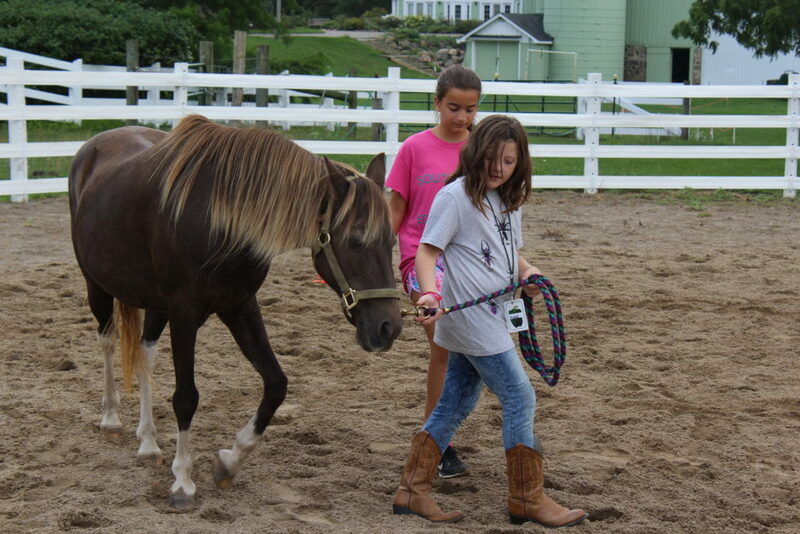 Then after lunch, campers got to learn some other horse-related skills, such as how to lead them and tie them to a post using a quick-release knot. 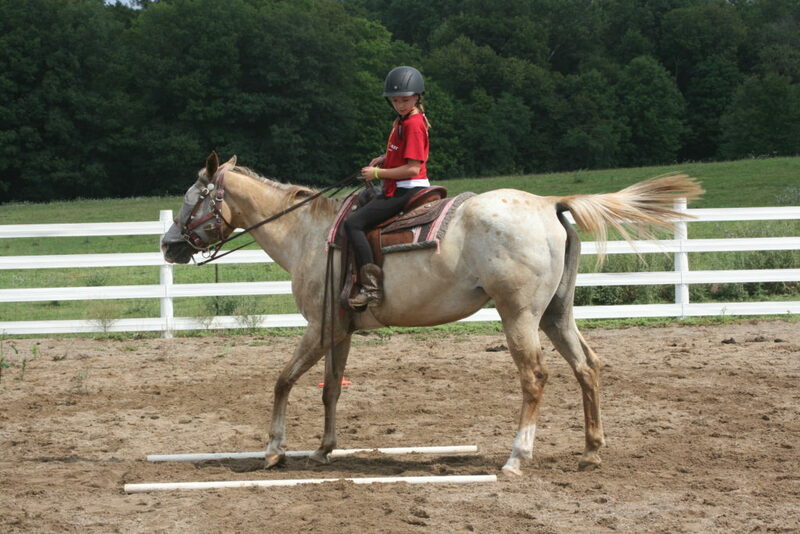 Horse campers also did a few fun projects! 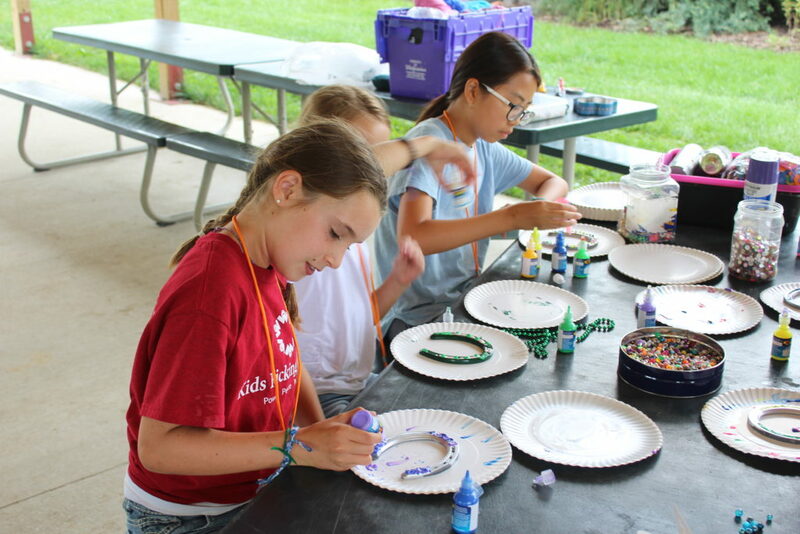 First up was horseshoe decoration, which really let the campers express their awesome creative skills! Second, peppers created nests to protect an egg. 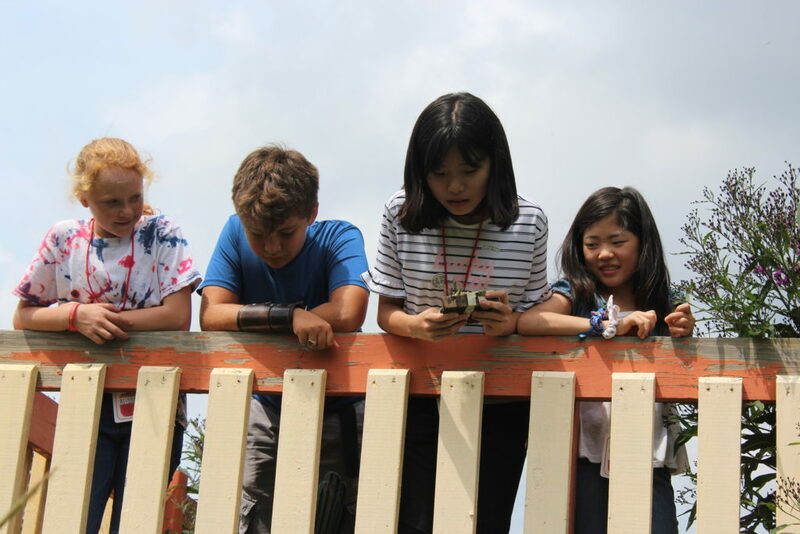 They then performed the ultimate nest test by dropping them from the tower in the Children’s Garden. 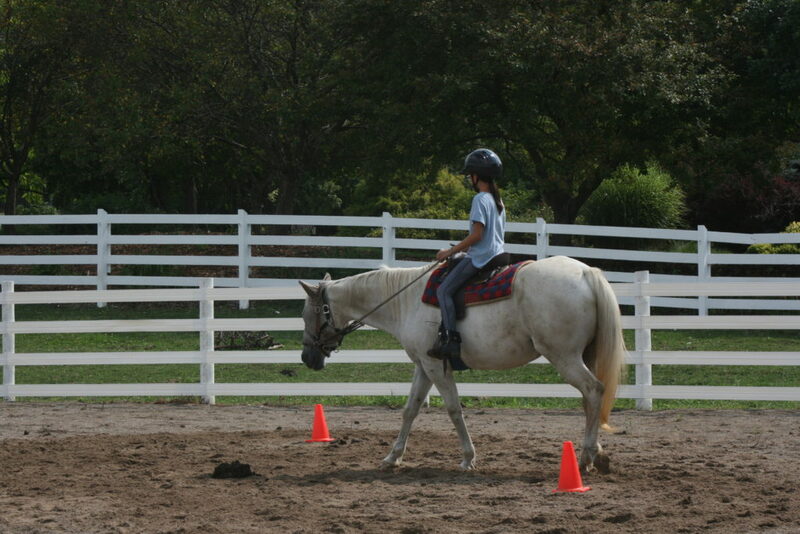 For more awesome Horse Camp pics from my investigation, click here! 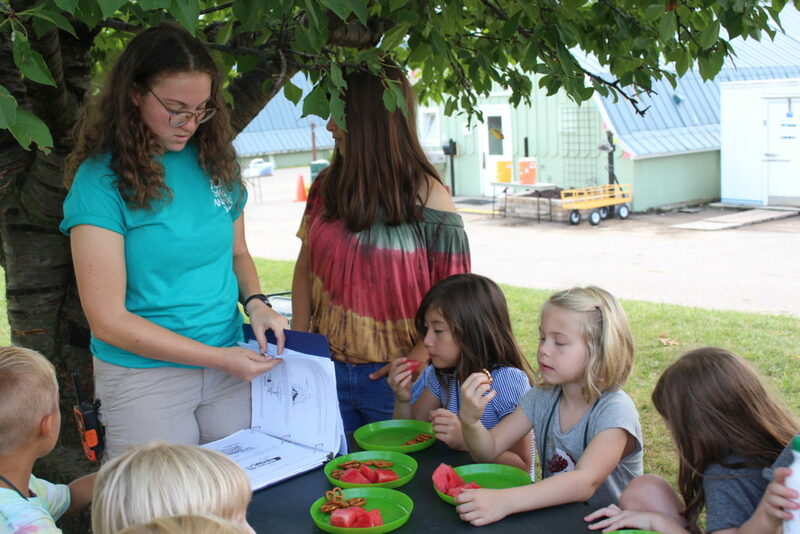 And of course, all campers came together for a wonderful Garden Kitchen! We only had afternoon GK today, but it was delicious enough to make up for the missing session. 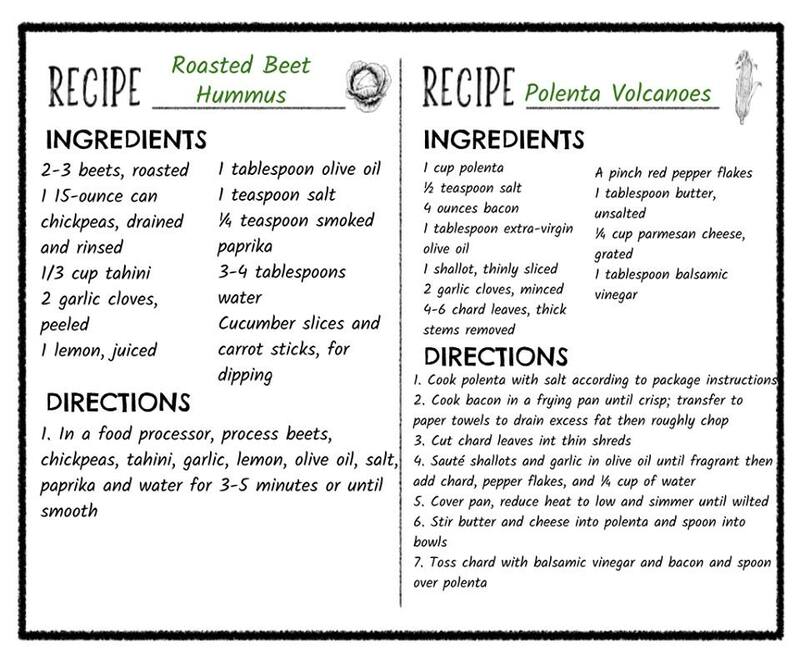 A tablespoon of water makes the hummus nice and smooth! 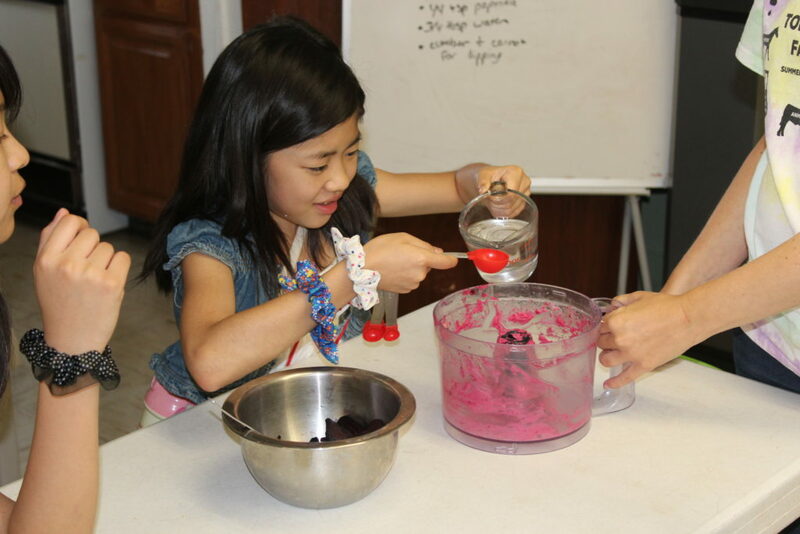 Pink hummus: what could be better? Thanks to Ms. Tanya for filling in today in Garden Kitchen! So as you can see, I’m getting a ton of material to make my case. But my ultimate conclusion? You’ll have to wait a little longer for that. Check back in tomorrow for all the details! 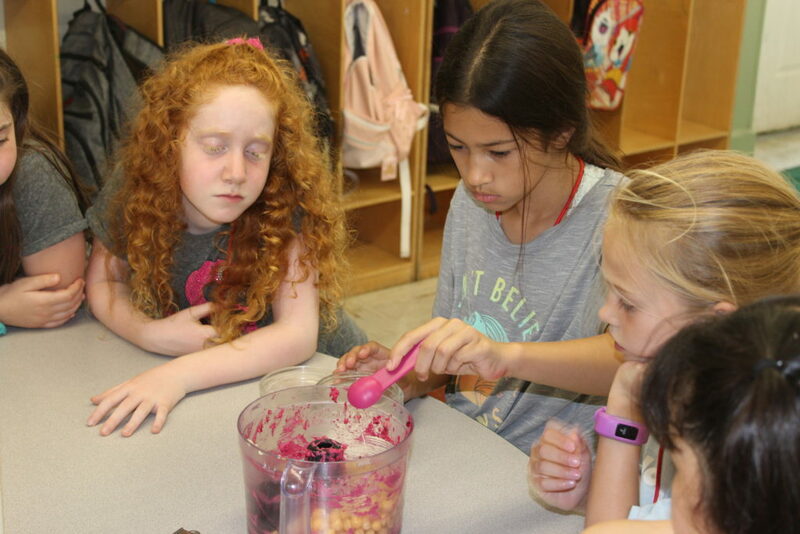 This entry was posted in 2018 Summer camp, Camp Blog, Summer Camp, Survival, Uncategorized. Bookmark the permalink.